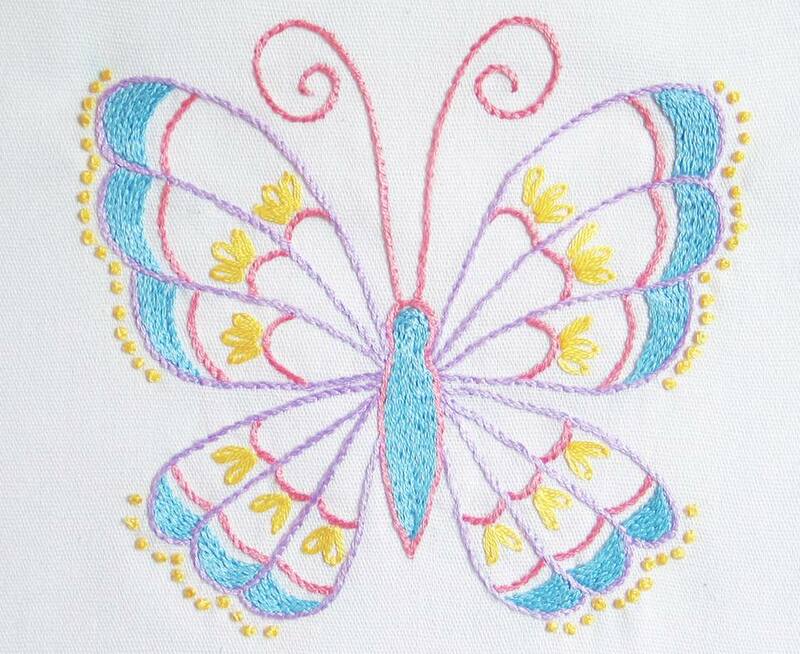 This beautiful, but simple butterfly is a great embroidery pattern for practicing basic stitches, which makes it a perfect beginning embroidery project. It's a design that you're likely to think of working for spring, but by changing the colors, you could make a summer, autumn or winter butterfly too! The stem stitch is one of the first surface embroidery stitches learned when working hand embroidery patterns. But did you know it can also be used as a filling? Learn to work the basic stem stitch and the stem stitch filling using this simple Stem Stitch Butterfly pattern. In this design, rows of stem stitch are worked closely together to fill the blue areas of the wings quickly and easily. This simple design would look adorable embroidered on a denim apron or tote bag, a child's sundress or stitched on a pillow. You could even stitch a few of these winged creatures, frame them in hoops and then display them together. Find the free printable pattern file, materials list and a few tips and variation ideas below. Fold the square of evenweave fabric into quarters and mark the center point of the base fabric. Center the pattern under the fabric and trace the embroidery design onto the fabric using the water-soluble fabric marking pen. For best results, use an embroidery hoop when working this project, placing the fabric securely in the hoop before you begin. Referring to the color photo for color placement, embroider the design using 2 strands of floss. (If you plan to enlarge the pattern, you may want to use more strands as you work.) Follow the stitch guide to work the design with stem stitch, French knots and the single chain stitch. Of course, you can always get creative with the colors and stitches. Use your favorite palette of embroidery floss or consider stitching the entire design in a single color, creating your own version of redwork. Instead of the stem stitch, work the outline in back stitch or another outlining stitch. Work the fill stitching areas with a scattered fill of cross stitches, seed stitch or lazy daisies, or replace the fill stitching with applique. Please Note: This pattern is copyrighted © by Cheryl Fall, and is free for your own personal use only and is not to be used for items for resale.